A chicken on the selvage? Love it. Even pink and yellow…a chicken’s a chicken. I finished all of my quilts + patterns + proofing (blah) + printing this week. Really I had 3 months to do it and I waited until the last week to do it all. Someday I will not procrastinate. Just kidding about that last part. Since most of my things are done I am going to procrastinate make a table runner…just for fun. I love your fabrics! Your very talented. Congratulations. gotta love a great selvedge! I love the prints and colors too!! Congrats!! This is gorgeous fabric – congratulations. Congratulations! I can't wait to use the fabrics–they look great! A great line of fabrics!! Congratulations Allison, what a lovely collection! Fabulous and congratulations! They look amazing! Congratulations! They are beautiful and I can't wait to get some! Congratulations Allison! I love the fabric line and can't wait to buy it! I enjoy your blog so much. You are such an inspiration to me…and I am probably old enough to me your mom! I love the prints in your collection! Can't wait to see what you've made with them. That's funny you said dinner with Martha Stewart. I've always thought it would be a great learning experience to spend a week with her & cook, garden, etc. :) Probably would also hear I'm doing it all wrong, but I would love to learn some of those things from her. Congrats again! I'm so excited for you. 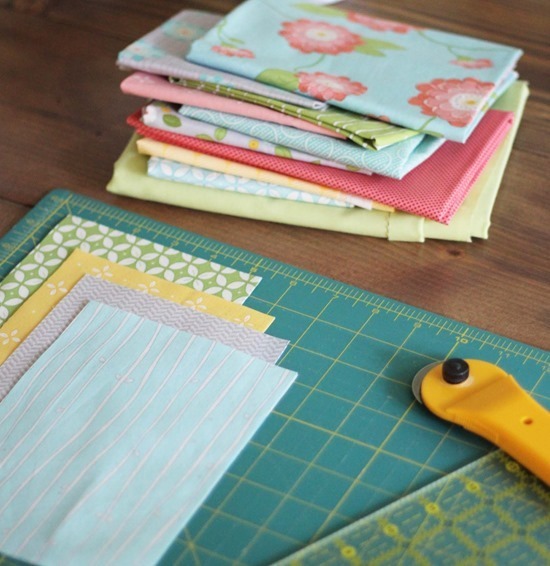 Really wonderful fabric designs you've done and love those chickens in the selvage! So exciting to have your very own line! I can't wait for the fabric in September. I love zinnias too! I was a dental assistant before I had kids and became a sahm. I ended up homeschooling them. If you ever need a second pair of eyes to proof read, give a holler. I proof my college age daughter's papers and she had friends asking me to do theirs! Congrats on the first line. I'll be sure to bug my lqs to get it. It's beautiful, Allison! I'm going to pop over and read the interview. Yours is the first blog I ever read and inspired me to learn to sew and quilt. Where will it be available to purchase online? I will definitely be getting it. I have three daughters so we can certainly use pretty fabric at this house. Mmmm, nice job Allison. They all are awesome, I love them! Love your fabrics!!! I could see myself making a Laurel dress out of all of them, especially the navy w/ flowers & the yellow prints. there are some of the fabrics I'd like to sew with. How exciting! They are so pretty! Can't wait to see what you've been working on. Gorgeous fabrics! Congratulations… And my friends who trim selvages for other projects will love the chickens on it! Aw. The get to know you section on that blog was very sweet! Congratulations! I can't wait to share in your fabric creativity! the selvage chicken is just too cute -congrats. Gorgeous fabrics! Can't wait! I can't wait for the book to come out too! There are so many great things to look forward to from you. I love the quilt in the Windham post that looks like circles without actually having curves. Very clever design! Congratulations! I love so much your fabrics. Cute, cute, cute…..what more can you say? Good job! Can't wait to buy!! Allison Harris, you have arrived! This is huge, and the fabric is fabulous! I love that fabric line! OH I WANT IT NOW! very nice! I am really excited for you and I really do like the eclecticness of the fabrics, very nicely done! 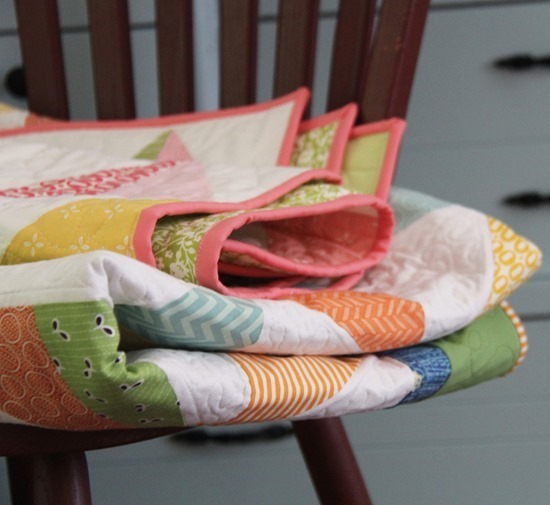 Congratulations, fabulous fabric and I really love every quilt I've made with your patterns! Looking forward to seeing what you make with all those pretty prints. This is so exciting! :O) Congrats on the fabric line! Can't wait to see it in person! Yay you! I'm so looking forward to buy some of your fabric, it's so beautiful, love the chicken on the selvage. Such fun fabrics, I can think of lots of projects but first I would do a pincushion cause they make me happy and are quick! Siiiighhhh! I am IN LOVE! Congrats on getting your name and chicken on the selvage! What an amazing accomplishment and I'll admit I am just a bit "jeal!" I will continue to sit in background and covet your talent! Love the selvage chicken, it is too cute! Congratulations on a great line! Can't wait to get my hands on some. I'm so stinkin' excited for you I can't stand it!!! Secondly may I congratulate you on your fantastic new fabric line. I love every single print and do hope that it will be available here in little old Wales (if not I might have to bite the bullet and make my first online purchase from the US). Sorry for the super long comment but I'm in love…….with the fabric that is! Too fun!!! Thanks for bringing so much wonderfulness into our world! I love your new fabric line! It is just beautiful! I can't wait to get my hands on some! That's VERY exciting! Love the selvedges! Congratulations! I loved them on first sight – the realized they were yours – how wonderful! Great job! Wow Allison, a book and a fabric line? Congratulations!! The fabrics are gorgeous, but that is what I would expect from you! Can't wait til they are available!! Eeekkk!!! I LOVE selvedge with pictures! I collect and specifically look for ones with the cute details like yours! The fabric is gorgeous. Congratulations!!! I'm so happy for you! I have always loved your natural sense of pattern and color. The fabric is fabulous! Great job little mom! I read your interview and saw the pictures of your lovely family. You are very talented. The fabric is very pretty, and I hope to see it here in Logan soon. Congratulations and keep up the good work! When I get my hands on those selvages I'll make you a custom pincushion! They are beautiful – will be marking them for my next order of fabric. Have an idea in mind already. They are adorable, and I can't wait to have some chickens of my own! And, I just wanted to let you know that I always say "why procrastinate when you can put it off!" Nice little write-up!!! Very nice family picture. Always of course love your stuff and have mentioned your blog to other quilting friends. And to think I purchased some patterns from you and you hand-wrote a little thank you in them! Your a celebrity! Best of luck to you! How exciting!! Gorgeous! Can't wait for it to come out! I've just got to add my voice to the crowds roar… Alison you have really created a beautiful fabric line – can't wait to get me some ! Congratulations ! Love the fabric and the chicken on the salvage is a great idea. I love your fabric! Can't wait to see more! And, I love that little white pin cushion in the last photo! Did you make it? Can we see another photo and maybe a tutorial? Love your new fabrics! And the chicken in the selvage is to die for!!! Put a BIG smile on my face! Awesome fabric. Congrats! Glad to hear there's a worse procrastinator out there than me. Sew pretty! And you just can't beat chickens on the salvadge! I am a chicken person ( I have 8) so I love it. This is definitely going on my wish list! Great fabrics…love the selvage! Enjoyed reading about you and seeing the pics of your sweet family. Your fabric designs are great. I'll be looking for them the next time I'm at my local quilt shop. Congratulations! Beautiful! I want to make a table runner with the collection, too! Congratulations! I looked at all the pictures AND read the whole post!! 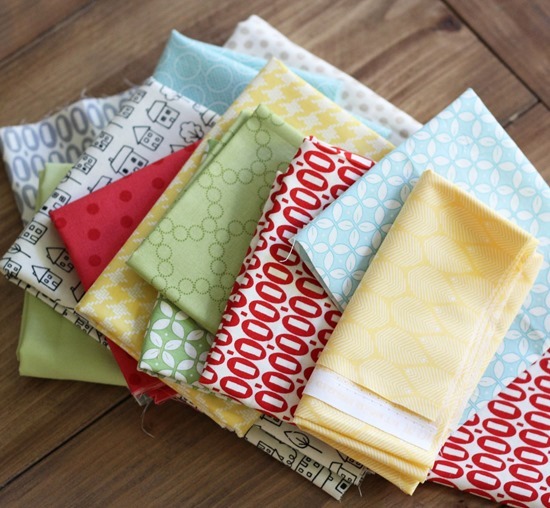 :-) Your fabric line looks so fun!! can't wait to see it all!! Congrats!! Neat to hear you grew up near the "Emerald City" of Seattle. 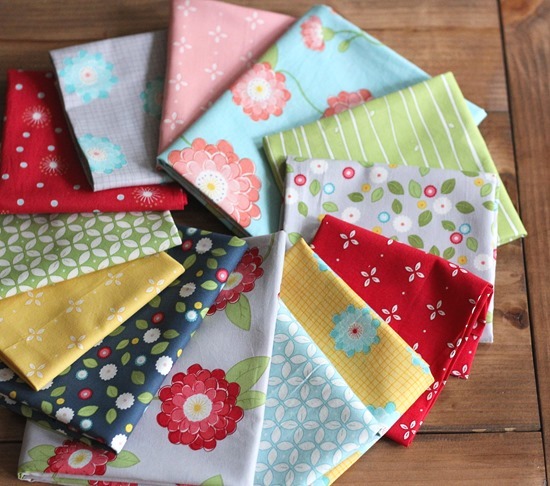 Your fabric line is gorgeous, and I totally understand the love of zinnias. Easy to grow and so colorful! Congrats! How exciting! 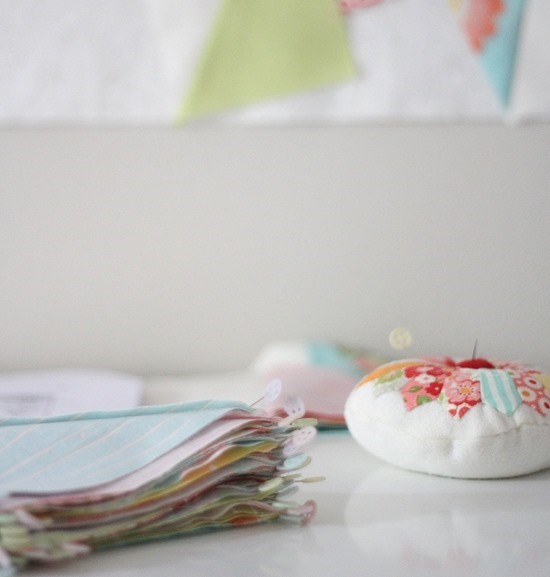 I don't follow many blogs but I check yours regularly and truly enjoy using your patterns. 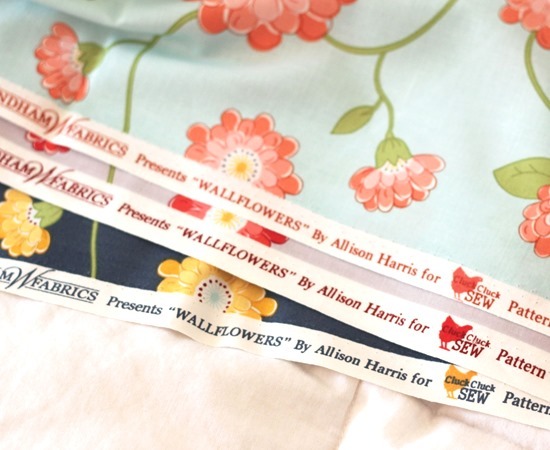 I'm so excited to be able to now buy your fabric, too! May The Lord continue to bless you. When can we buy it? I love the colors! So charming! Have fun with your little sewing break. I just love your line! I can't wait to get it! Congrats.